We love celebrating the Fourth of July with fun picture books about America's Birthday! Fourth of July Mice is a perfect book for celebrating the fun of the fourth. In this story, a mouse family partakes in a parade, a picnic, a swim, and of course, a fireworks show! Currently, my son is obsessed with fireworks. This is a cute fourth of July book that includes a grand fireworks show. Corduroy's Fourth of July (Corduroy (Board Book)) In this story, Corduroy and his friends participate in the fourth of July festivities... and take in a firework show. I like that Tyson (age 17 mo) can handle this nice board book and point to the flags and the fireworks. Thanks to A Mommy's Adventures for the book suggestion. My boys also love parades. Last year, we found this super fun book idea from JDaniel4's mom. Grandma Drove the Garbage Truck In this story, Grandma has to fill in for her sick sons on the Fourth of July. She drives the truck around town, picking up balloons and roses and other items as she goes. She inadvertently decorates her truck and drives into the Fourth of July parade! The fourth of July is also a fun way to sneak in some learning. These books should help my boys learn about our country, our flag, and our pledge to the flag. Pledge Of Allegiance 2001 The text is the pledge as written by Francis Bellamy. However, each page features on phrase of the pledge along with beautiful photos depicting that phrase. 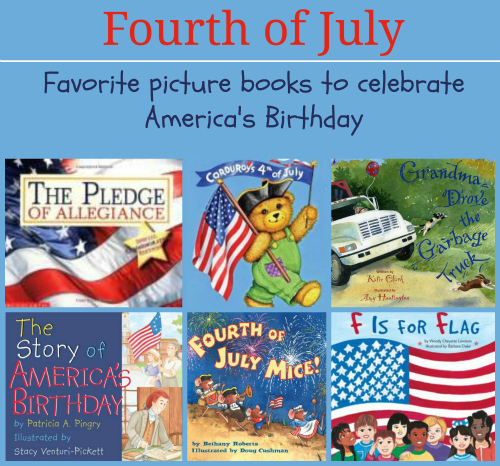 The Story of America's Birthday Patricia Pingry is a go to author for holiday themes. This sturdy board book does a great job of introducing the story of Indepdence Day in a simple way. F is for Flag is a perfect pick for flag day (June 14th) but it also works great for Independence Day. This story teaches not just about the physical flag, but about what it symbolizes-- unity, family, and our country. (Thanks Nursery Rhymes and Fun Times for the suggestion). The Fourth of July (Independence Day) is one of my favorite holidays. I love that the only thing required for this holiday is picnics, water games, or laying around on blankets to watch fireworks. There are no lavish meals or presents to buy. We just get to relax, and the hubs gets a day off work! Now that's a holiday! We're always looking for great books to enjoy? Do you have a favorite Fourth of July or fireworks book? Please share! Those are great books! We read many of them last year. I especially like F is for Flag. Happy Independence Day and thanks for joining WMCIR! Great idea for a post! My favorites are Chris Gall's AMERICA THE BEAUTIFUL and THIS LAND IS YOUR LAND illus. by Kathy Jakobsen. Thanks for the recommendations, off to check them out! Nice list Jackie, I must look for these at the library. Thanks Reshama! I hope you find some you enjoy, let me know if you have any suggestions for patriotic books as well. Thanks for the feature! You have lots of other great books linked up in that post as well! What a great collection! We love Grandma Drove a Garbage Truck at my house. I think we may have originally gotten that suggestion for that book from you a few years back! It has remained a favorite at our house too-- and not just for the 4th of July!